Mamaearth's DEET & Alcohol free Anti Mosquito Fabric Roll On has no toxic chemicals. 5 drops of this non staining natural blend of essential oils provides excellent protection of up to 8 hours day and night against dengue, malaria and chikungunya spreading mosquitoes. 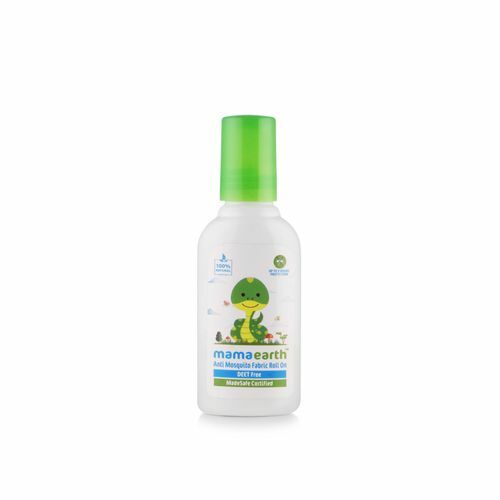 100% Natural Protection - Mamaearth's Fabric Roll On contains 100% natural mosquito repellent ingredients. Blend of Citronella, Eucalyptus & Lemongrass oil guards your family from mosquitoes. Upto 8 hours protection - Apply 5 small drops on your fabric for complete outdoor as well as indoor protection of up to 8 hours from mosquito bites. Protects From Dengue, Malaria & Chikungunya - Blend of Citronella, Eucalyptus & Lemongrass oil is used for their strong insect repellent properties. Together they protect against from mosquito bites of Malaria, Dengue & Chikungunya spreading mosquitoes. Does Not Stain Clothes - Mamaearth's Fabric Roll On does not require to be applied on skin. Apply 5 drops of non staining fabric roll on clothes, school bags, cots, prams of your baby from mosquito protection. Certified Toxin Free - With no harmful ingredients like DEET & Alcohol, it protects everyone in your family including babies from mosquito bites.